Download online videos and accelerate downloads by up to 5 times. FLV Downloader Pro is a professional Windows app for downloading and converting your favorite videos from video sharing sites. It accelerates your downloads by up to 5 times! FLV Downloader Pro supports YouTube, Facebook, Dailymotion, and hundreds of other video sharing sites. FLV Downloader Pro features a multithreading technique that can increase your download speeds by up to 500%. 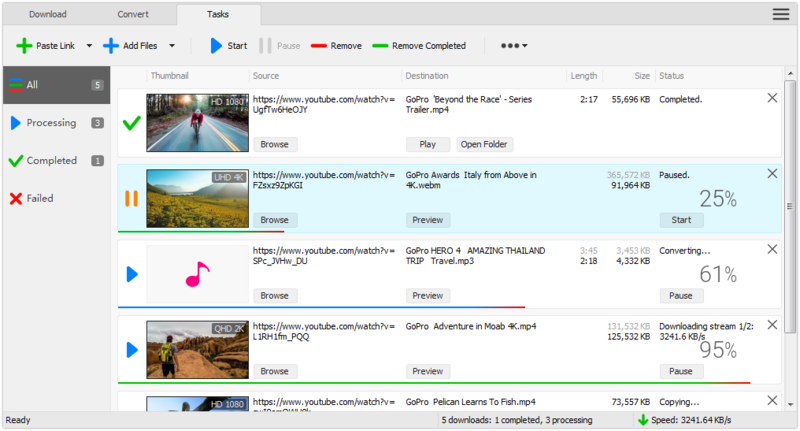 FLV downloader Pro enables you to download an entire YouTube playlist at one time with just a few clicks. You may pause your downloads at any time. FLV Downloader Pro can resume broken download from where it was interrupted. You can directly download only audio stream from YouTube, without downloading the entire video file. FLV Downloader Pro can automatically start downloads at a set time, and shut down your computer when all done. Convert videos to various formats. FLV Downloader Pro can convert videos to MP4, MP3, FLV, WMV, MOV, AVI, MKV, MPG, OGV, VOB, WEBM, DVD, VCD, etc. While downloading, you can click the Preview button to play incomplete video.